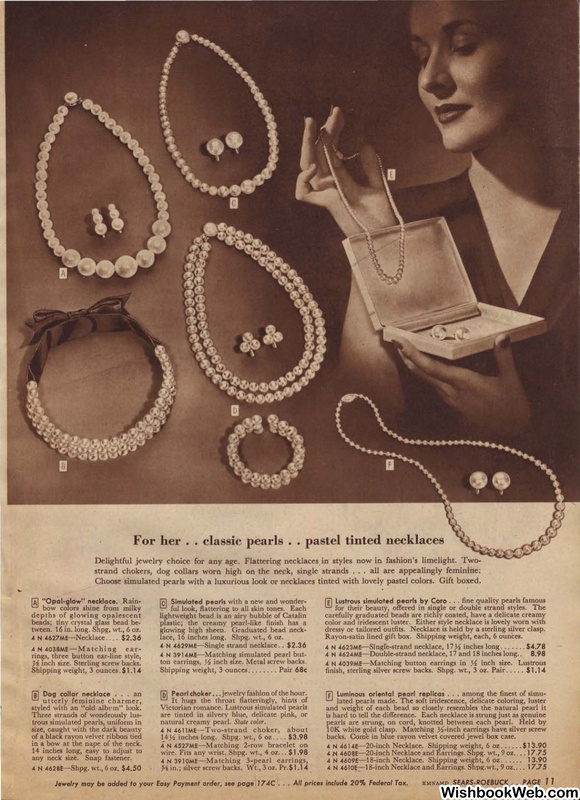 Choose simulated pearls with a luxurious lobk or necklaces tinted with lovely pastel colors. Gift boxed. mch size. Sterling screw backs. lace, 16 inches long. Shpg. wt., 6 oz. inch size. Metal screw backs. dressy or tailored outfits. Necklace is held by a sterling silver clasp. Rayon-satin lined gift box. Shipping weight, each, 6 ounces. Pearl choker ... jewelry fashion of the hour. styled with an "old albem" look. backs. Come in blue rayon velvet covered jewel box case. in a bow at the nape of the neck. any neck size. Snap fastener.